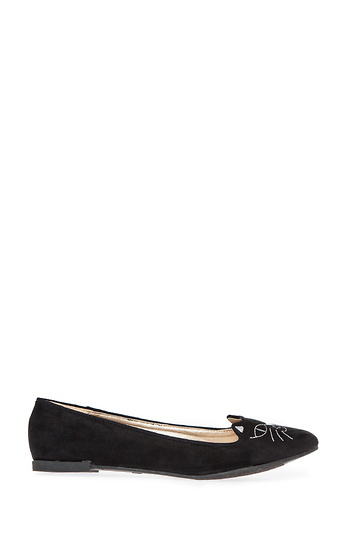 Micro velvet flats featuring an embroidered cat face on top of shoe. I got them in black, and they are sooo cute. While they don't have a lot of support or cushioning, they're still pretty comfortable. Definitely go with the recommendations in sizing as they run small. Just received my adorable flats and I love them! I purchased the blue color and cannot wait for fall to bust them out. Also, they are true to size, I got my normal size instead of listening to the description that said they run small. Love these! But, they fit way smaller. I am having to exchange them for a half size up. These shoes are soo adorable and fun to wear! I wear them to work and out to play! love the color... the fit is true to size.. and who doesn't like wearing cats on their feet?! I got the powder blue color and I LOVE these. They are adorable, versatile and comfortable. SO stinking cute! Plus they're comfortable :) A+! I first saw my friend wear the pink ones and I HAD to order them. Just recieved the sky blue flats and I ialready love them! After reading the comments, I ordered half a size bigger than what I usually wear (6 -> 6 1/2 )and it fits perfectly. However, I'm not sure if they will last past a summer since the quality seems a little on the cheap side. However, I am going to order the pink one because they are TOO pretty, cute, and unique! I just got mine in the mail today I love them so much perfect for a night out or casual look with some tights , I recommend them to anyone plus their comfortable oh by the ways just a For your information if you are a size 6 1/2 like me order a size 7 as stated on here they run small and the 7 is actually perfect hits right a little before my big toe . Super adorable. I just got these in (black) after Christmas, and I now I want another pair for when these wear out! I want every color! Cute with skinny jeans, skirts, etc. I am super picky and love these.